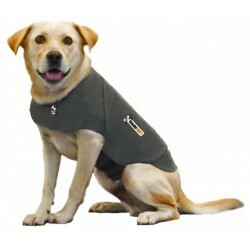 Now there's an easy way to protect your cat and dog from gastrointestinal worms. Available in different pack sizes. Drontal Allwormer Chewables and Tablets kill every type of intestinal worm found in Australian dogs, including roundworm, hookworm, whipworm and tapeworm. Drontal not only protects your dog from worms, it also provides protection for the whole family from gastrointestinal parasites. 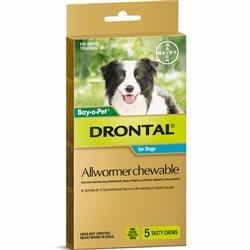 Your veterinarian can also advise whether your dog needs Drontal Allwormer to control giardia, which causes diarrhoea in dogs. Your dog won’t need to fast before taking Drontal unlike other wormers. Drontal is so safe it can be used on puppies from 2 weeks old. 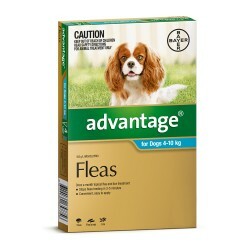 It can also be combined with other heartworm prevention and flea or tick treatments such as Advantage for dogs or Advantix for dogs. Made with real liver, Drontal Chewables come with a flavour guarantee – if your dog doesn’t love the taste you’ll receive a Drontal tablet free. 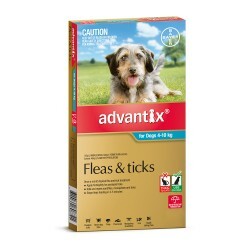 It can also be combined with other flea or tick treatments such as Advantage for dogs or Advantix for dogs. With Drontal, worms are no longer a worry for you or your pet. 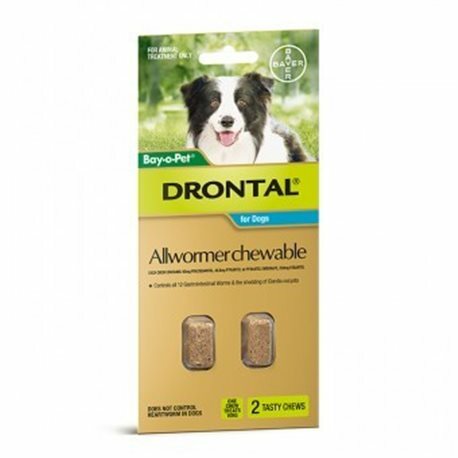 I have always used Drontal Allwormer for my two beagles, being chewable its easy to administer. Great product that does a fabulous job at keeping my two Beagles healthy.